"This book is a collection of 129 problems that the author encountered whilst playing training games against the neural net programs, Snowie and Jellyfish. Each position has been subjected to exhaustive analysis to find the best move and the positions vary from relatively straightforward to highly complex where very few top players get the right answer. "Chris Bray, in What Colour is the Wind? "Over the years Norm, like the rest of us, has written down positions of interest to him, and run them through Jellyfish. His book is a compilation of those he found most interesting. He took the positions to California experts Ray Fogerlund and Art Benjamin, who independently reviewed them and offered feedback and suggestions for further exploration. 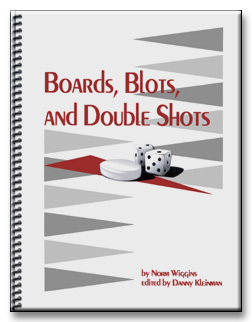 COVER: You are an experienced backgammon player who has already acquired considerable skill. You already hold your own in chouettes among your peers. If you go to a Backgammon Tournament, you play in an intermediate division. You would like to become an expert and be able to compete on equal terms in the top bracket, the one that is generally called the open or championship division. This book is for you. It's also for the open player who would like to add some new weapons to his arsenal.